Wait…you’re not a member yet? You’re not enjoying fast, cheap, international shipping on whatever you buy from overseas? You haven’t yet joined the hundreds of thousands of Buyandship members that use our service every day? Not to worry! Come check out 👉Part 1: Intro and Registration👈 to learn more about us and how to register. It’s free! The next important step in being a member is adding an address to receive your packages, so let’s do that now. If you haven’t logged in already, then go to https://www.buyandship.com.tw/login. Enter in your email address (電郵地址) and your password (密碼), and click Login (登入). If you’ve logged in before, then your browser will take you directly to your account. This page is the Member Center (會員中心), and you’ll always land here first when you log in. On the left is the navigation bar, which will take you to different areas of member service. For your shipping addresses, click on the third option: Recipient Address Management (收件地址管理). Here is where you can add, view, and manage all your shipping addresses. 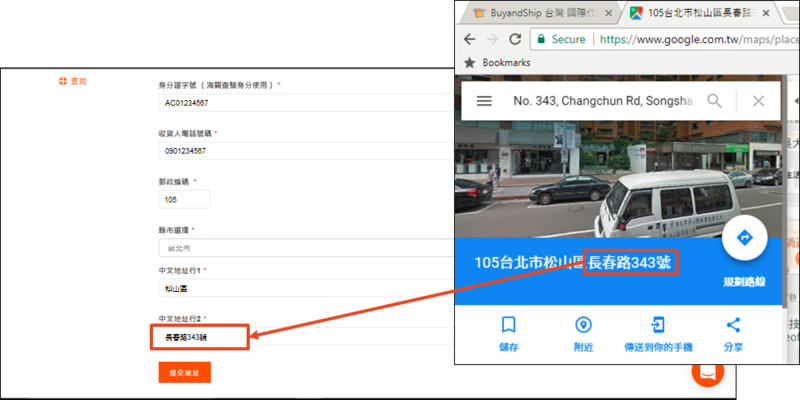 Click on the Add New Address button (新增地址). Fill in the first name (名) and last name (姓) of the recipient. You can use English or Chinese characters here. Fill in the Taiwan ID number (身份證字碼) and phone number (收貨人電話號碼) of the recipient. If you’re entering in your own address, put your own information in. If the recipient doesn’t have a Taiwan ID number, then an ARC number or passport number are also acceptable. 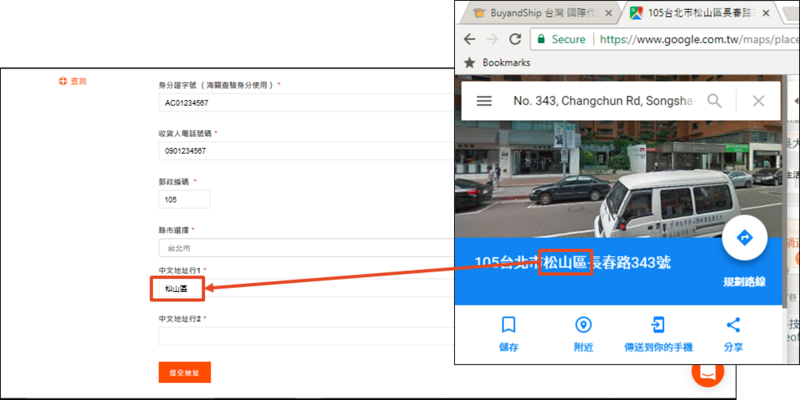 Type in your postal code (郵政編碼) and select your city (縣市選擇). Next step is to put in the address information. This is a little tricky because it has to be in Chinese, but not to worry! Google Maps makes it a snap. 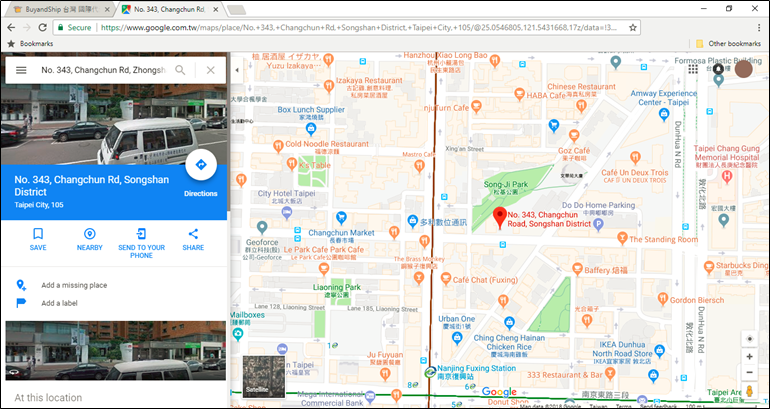 Head on over to Google Maps (https://www.google.com.tw/maps). Type in your address in English, and confirm the location. Click in the URL bar and go all the way to the end. Then, change the end to include “?hl=zh-TW”, or add it to the end of the URL. Press the Enter key to confirm the change. The address will be instantly converted from English to Taiwan Chinese! Now, copy and paste the district into into the first line (中文地址行1). Then, copy and paste the rest of the address into the second line (中文地址行2). Last step is to click on the Confirm button (提交地址) at the bottom, and then you’re done. Congratulations, you added a delivery address! If you wish to delete an address at any time, click the Delete button (刪除) next to it. Please note that deletion is irreversible, but you can add as many addresses to your address book as you like. Now that you have an address, you’re ready to unleash your inner shopping demon. Head on over to 👉Part 3: Shopping and Declaring👈 to learn how to use the warehouse addresses when you shop. Not yet a member? Come sign up! Every new member gets NT $120 in free shipping credit, so shipping your first pound with us can be less than USD $1. Click on the banner below to get started! Part 5: Refer a Friend!